The mythological world of Rick Riordan’s “Percy Jackson and the Olympians” will come to life at Fairytale Town’s annual Safe and Super Halloween event. 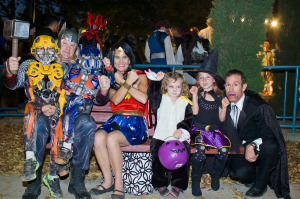 Families can enjoy three nights of fun and trick-or-treating at the storybook park on October 24, 25 and 26 from 5 to 9 p.m.
Young heroes can go on a quest to Mount Olympus to meet the infamous Olympian Zeus. Families will enjoy exploring the lair of Polyphemus the cyclops, the replica Parthenon, the Oracle of Delphi and Medusa’s garden. Seventeen candy stations will be scattered throughout the park for trick-or-treaters to visit. The evening also features a nightly costume parade at 8:30 p.m. and hands-on activities inspired by the books and Greek mythology. Puppet Art Theater Company will perform “Frankenswine,” a zany, Halloween-themed version of “Frankenstein” told by a cast of pigs, in the Children’s Theater at 6, 7 and 8 p.m. It’s Halloween night, and Doctor Frankenswine and his sidekick, Snout, have created a Frankenswine monster out of pork chops, bacon, and other assorted quality lunch meats. Dr. Frankenswine’s quest for a brain for his monster leads him on a madcap adventure with tons of Halloween silliness, confusion and audience participation. Tickets for the puppet show are $1 for Fairytale Town members and $2 for nonmembers. This year marks the 28th anniversary of Fairytale Town’s Safe and Super Halloween, which provides children and families with a safe place to trick or treat, have quality family time, and enjoy a great evening of Halloween-themed, family friendly fun. Advance tickets are $7 members and $10 nonmembers. Beginning October 24, tickets are $9 members and $12 nonmembers. Children ages 1 and under are free. Tickets are available for purchase online at www.fairytaletown.org, by phone at (916) 808-7462 or in person at the Fairytale Town box office. Safe and Super Halloween: The Adventures of Percy Jackson is sponsored by Smile Business Products, ScholarShare College Savings Plan, Make A Smile Dentistry, SMUD, SAFE Credit Union, PeopleFinders, Whole Foods and State Farm. This entry was posted in Haunted Attractions, Home Page, Home Page Slider, News and tagged Fairytale Town, Safe and Super Halloween. Bookmark the permalink. I love small parks like these. If I had the time and finances, I’d do a West Coast small amusement/theme park tour and skip all the big boys. There’s just so much charm and heart in these little places. The hardest thing about Halloween in California is finding the time to attempt to hit everything that is available! It’s a little easier in Central and Northern California – but here in the Greater Los Angeles and neighboring regions – it’s crazy! Happy haunting, wherever you end up!